Just this week I started three new projects… despite my inability to finish several more from the past two years. Every studio seems to have its share of UFOs (UnFinished Objects), so I don’t feel so bad. Projects One and Two are sashiko pillowcases. The first is a scrap of yukata cotton that caught my interest before breakfast Monday morning, then managed to find its way into my hands soon after the dishes were tidied up. I have yet to photograph that one, but rest assured I will post updates soon. 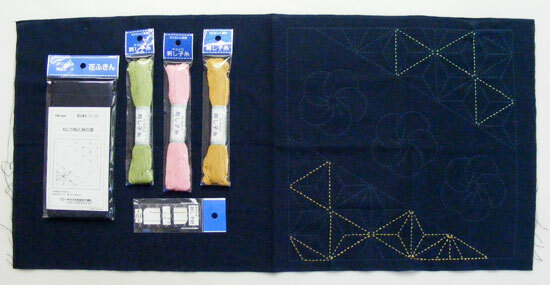 The second is another of the Olympus sashiko kits from my shop. I actually started this one at Fanime Con back in May. I found that putting one of these kits in the hands of passersby had the effect of getting more people interested in how sashiko worked, how easy it was, and how satisfying it could be to watch the patterns evolve. A dozen different people added a line or two of stitches, shared a laugh or a smile, and learned something new. This last project is quite exciting. 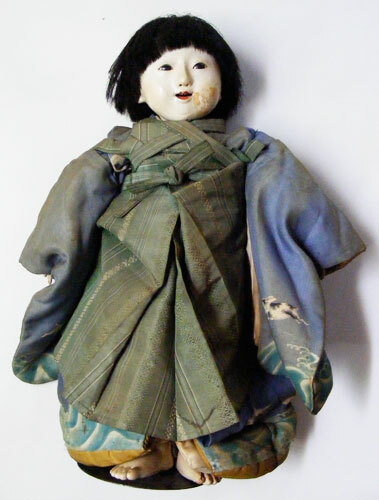 This ningyo (Japanese for “doll”) smiled at me from inside his glass case in an estate liquidator’s shop and I just had to take him home. Despite years of improper storage (full sun!) and being carelessly dressed all that time (which led to significant sun damage in strange places), he is a charmer. He’s had some sloppy repairs done over the years, but hopefully, with the help of an experienced restorer, he will get the sparkle in his eye back soon. I will chronicle his restoration here as we go. Thanks for taking my order. Just want to confirm the total price so I can mail a check to you. Sorry I missed this, Barbara! Glad we got it sorted.